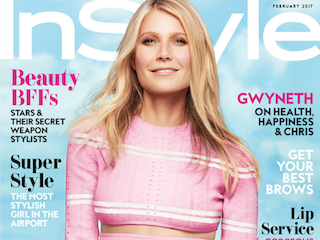 Gwyneth Paltrow is InStyle’s latest cover star. As such, we’re all reminded just how obnoxious the actress can be. Do you think, just for one second, that Paltrow is actually working hard on Goop, or that she had other people do that for her? And even if she is working hard, she is a filthy rich celebrity. This allows her the privilege of launching a completely absurd site that continues to exist only because she’s a filthy rich celebrity. It’s comforting to know that in times of extreme uncertainty, Paltrow remains exasperatingly glib.